Peel and grate the potato. Roll shredded potato up in 4-ply of paper towels and squeeze out the moisture. Repeat if necessary until most of the liquid is gone. Transfer to a bowl and toss with salt & pepper. Preheat a large fry pan (preferable non-stick) to medium-high. Place one teaspoon of oil in the hot pan and swirl around. Add potatoes, patting them evenly and cleaning up edges. Reduce heat to medium-low and cook undisturbed and uncovered for 15 minutes. When bottom is crisp, turn potatoes over. If needed, cut into wedges for easier turning. Add 1/2 teaspoon of oil and swirl it around to reach all sides. Cook another 15 minutes until golden and crisp. Taste for salt. Hash Browns - Perfect every time! 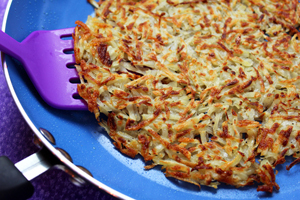 68 Comments on "Crispy Hash Browns"
Yes, Jenny CAN cook! I was so happy to find this recipe, just in time for Easter!!! I found it in 2013, and was amazed to see it show up again. What kind of a pan are you using in the hash browns video? It looks like a saute pan with very low sides. It looks helpful for cooking different kinds of things. After many years of soggy potato mush a friend told me about the YouTube video for this recipe. Came out perfect. Thanks Jenny. I’m looking to make more of your recipes. I make them exactly the same with one exception. I didn’t realize you have to squeeze out all the liquid. Now I know what I have to fix. Thank you for your wonderful video! It was simple and easy for anyone to understand and follow. You are a great cook. Sunday morning and I just cooked up maybe my twelfth batch. Crispy and delicious once again. Thank you for the recipe and excellent video. After watching this video, I will try my first ever hash browns. I’ve printed out the recipe so I will always have it handy. 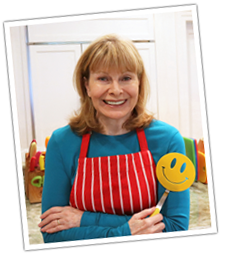 Jenny, I want to thank you so much for this wonderful recipes for Hash Brown Potatoes. They turn out just the way I love them. I always had to go to a restaurant to get hash browns that were cooked like this. Now I can do my own and have them more often. My error was not getting the moisture out of them with the paper towels. That is the most important step to get them dry. That was why mine never turned out the way I love them crispy. You are a great Chef Jenny. Keep up the good work, and I thank you for teaching me your trick for crispy hash brown potatoes. Ever considered or tried using a salad spinner to get out the moisture? I recently heard about that trick for zucchini or “spiralizer-ed” veggies. Just a thought…line the spinner with paper towels so removing the veggies is easier and lessen-up. Awesome idea! Thank you. This would be especially helpful when doing a large batch. I will have to try this for sure! Jenny, Wow & Cool Beans. First time I’ve seen you on the Net. 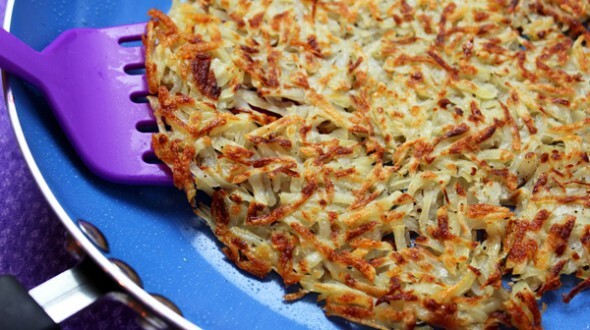 Great recipe for hash browns. I added some onion and a tad of garlic came out great!! You Rock Girl ! ! ! Made the best hash browns in my life last night thanks to your recipe. They were delicious! I did exactly what you said and my family loved it. I love your food and you do a great job making things so simple become so delicious. Keep on making your awesome food. My OA in the hip has hit me harder than I expected so my wife is doing some of my chores. So I am the designated cook. Oh oh, TV dinners were not cutting it. So I downloaded apps and scoured the internet and found you. God sent you are. I just follow along with exactly as you show. Tried these hash browns and got a thumbs up from the wife. Thanks so much. She wants more tonight, lol, I will do it. You are turning me into a decent cook! Just to see you so Relax, but So positive and Persuaded of Your Knowledge, so Fine and so Simple.. it is like Magic, and Pleasant to have you for Friend ! My recipe is similar to this and I’ve made them many time (AKA Potatoes pancakes) and I have found that the best way to get them crisp is to let your grated potatoes soak in cold water for about 15 minutes, then drain and rinse a couple of times, then dry them well …. this removes all the extra potato starch…hence, crisper results! Man oh man. I’m using my 30 min. to write how cool your recipes and teachings are. Am wondering if you are surprised at how helpful and thankful we are for your teachings. Did you expect so much love? I never expected so much positive response for just sharing what I cook. It’s very gratifying. You explain every thing so simply and it’s quick and easy to follow you. Love your humor also. First comment ever. I am going to try your recipe for making hash brown potatoes tomorrow. Hope they turn out as Jimmy looking as yours. Thank you for sharing. Can thawed frozen hash browns be used for this recipe or must the potatoes be fresh?? Love your recipes .. especially the Polish ones .. you make it look so easy to cook them!! Thanx!! Jenny!! Jenny, Thank you for this technique. Hash browns have never turned out until today. This was first recipe we made by you, and it delivered. Kids had it with leftover steak for breakfast. Thank you for sharing. Love your videos and the simplicity of your recipes! I Iove your hash brown video! I watched you on t.v. when I was a kid, now as an adult, I can see you cooking on YT. Thanks! These hash browns are wonderful! Easy and perfect, a little time consuming, but so worth it. Thank you. Love your recipes. So excited to find this site. Could you please tell me what brand frying pan dos you use? I use several brands but the one in the video is from the Calphalon line at Target. Thank you Jenny for such a speedy reply. I would definitely look for this pan. You should make a video of what all pots and pans you use frequently in the kitchen, and how to take care so they last longer. Somehow, my pans get bad so often. Hi Jenny! Love your videos!!! Where did you get that cute quaking duck timer? I want one!!! You are a very sweet person I wish I knew you!!!! 1. just slide the cooked side of the potatoes out of the pan onto a plate and cover them with a second plate. 2. flip the plates over so the cooked side is up. 3. remove the top plate and slide the uncooked side of the hash browns into the heated, oiled pan and let them finish browning. Excellent ! I grate the potatoes in my food processor using a grate disc. Instead of using paper towels I use a cheesecloth. Just put grated potatoes on cheese cloth gather it up on all side an squeeze until you get no more water out of them. Very easy. I keep the cheese cloth just rinse out an hang to dry an you can use it again an again. Very handy to have in the kitchen. have made these.. very good…but like another way better. and cook way faster.dont peel potato it will come off when you grate potato.. boil potato or microwave till just barley soft chill potato and then grate potato. can keep in freg till ready to use…place small amount ouf oil or butter in pan and place the amount of potato on oil ….I also put garlic powder on mine before turning…. yes!! Precooking the potatoes is a great trick! My mom precooked a 10 pound bag of Russets every week since we had potatoes every day (sometimes 2x a day). American fires with fried onion (and cheese if you like) is also a quick option with these potatoes. Couldn’t wait to try these and entirely skipped absorbing moisture with a paper towel and forgot to salt and pepper until they were in the pan. Even left them in for a few extra minutes because I got busy elsewhere – oops! And you know what ? They still turned out fabulous! Can’t believe I ate a whole potato and then wanted to make some more ! Jenny CAN Cook AND teach the rest of us too!! You’re awesome! Come to my house, no problem. Better yet, I’ll come visit you at your house, so there’s less mess – lol. But I’ll help you do the dishes and clean up :-). You are just a really wonderful person to learn from. How did you do the videos? Obviously had a helper, but wondering about the camera, editing software and some of the tech stuff. I can tell it was a bit of work. Where can i boy the duck timer? We love u Jenny!! Please make more videos! For years I longed to make has browns. I tried your recipee yesterday. I used too much salt, but still delicious. I tried them today again with less salt and they were even more delicious. Your recipees are very easy to understand. Thanks again. I just made these- without your recipe in front of me… While they were really good, I used too much oil… Will make again- following your recipe exactly. I just made these and they were perfect. Absolutely the best ive ever had! Thanks so much for this video!! I made them and they came out perfect!! Much love & positive thoughts sent your way! Just made this, technique is perfect. thanks Jenny! The hashbrowns I made were soooo awesome. The paper towel technique is complete gold and such a vital part of the process I learned. Wow…. I can even imagine the taste now. So hungry and Im going to try this for my dinner tonight! And Jenny, can you make a video of burger patties which are healthy and low in fat? I’ll look forward for that video thanks! Thank you for this video. I cook these all the time now, had a couple of burnt ones, but mostly good. So simple!!!! Just discovered this site and I am now checking out recipes. Jenny, I love your down to earth attitude.!! you are great.!! Thank you so much! It worked perfect…!!!!! these are freaking easy and delicious. I tried this and it works!! Thanks Jenny !! !